A journal written by a prisoner of war in the true story behind the film The Great Escape has sold at auction for £13,500. He played a key role in digging tunnels through which inmates escaped from the Stalag Luft III prisoner of war camp. This Sunday marks the 75th anniversary of the famous breakout. Flt Lt's Phillips' collection of photos, medals and the diary, described as "gold dust", were bought by a private UK buyer. Among the medals in the collection is a Distinguished Service Order presented to Mr Phillips, who died in 1997. His diary retold how prisoners dug the tunnels and smuggled the excavated sand in their trousers. The mass breakout, on the night of 24 March 1944, inspired the 1963 Hollywood film starring Steve McQueen, James Garner and Richard Attenborough. The journal was sold by Flt Lt Phillips' nephew Mark Phillips, 59. He said: "The diary is believed to be the only one of its kind to survive the rigours of the PoW camp. "I put it up for auction as I had no-one in the family to pass it on to. I hope it's gone to someone or an institution that will cherish it. "Viv never spoke of his time in the PoW camp but had many fond memories of his time as an active officer." Adrian Stevenson, militaria expert at auctioneers Hansons, said: "I'm delighted this unique journal will stay in the UK. 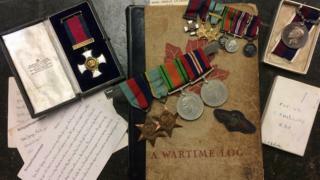 "It's absolute gold dust for any militaria collector. It beautifully captures camp life and the gritty resilience of the prisoners."